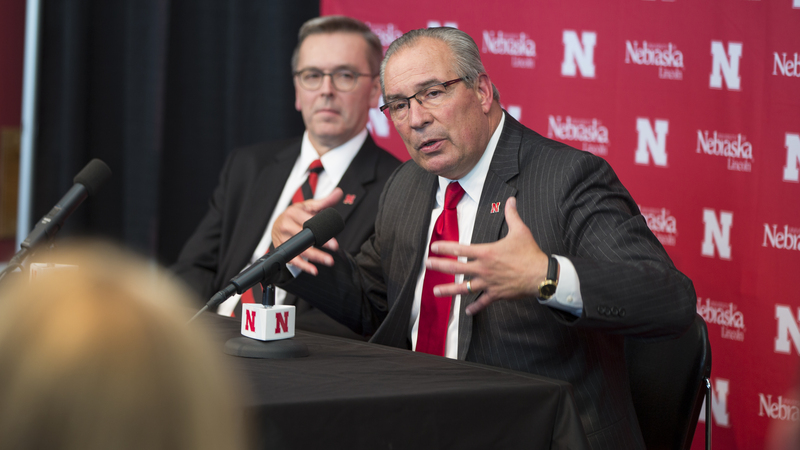 Bill Moos, Nebraska's new director of athletics, talks during an Oct. 15 press conference in Memorial Stadium. The new hire was announced by Chancellor Ronnie Green (left). 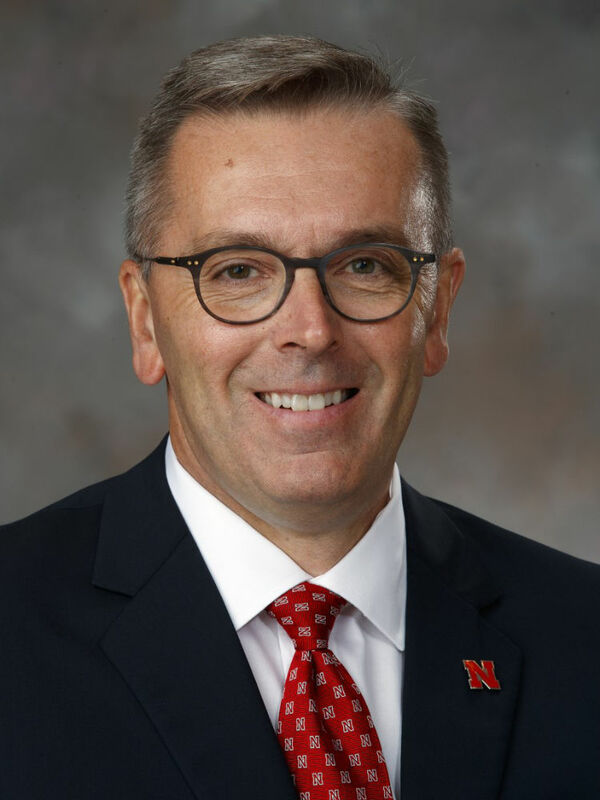 Bill Moos, a distinguished collegiate athletics leader who elevated programs at the University of Oregon and Washington State University to national prominence, has been named the University of Nebraska’s new director of athletics, Chancellor Ronnie Green announced Oct. 15. Moos, who has been director of athletics at Washington State since 2010, will begin his tenure in Lincoln on Oct. 23. 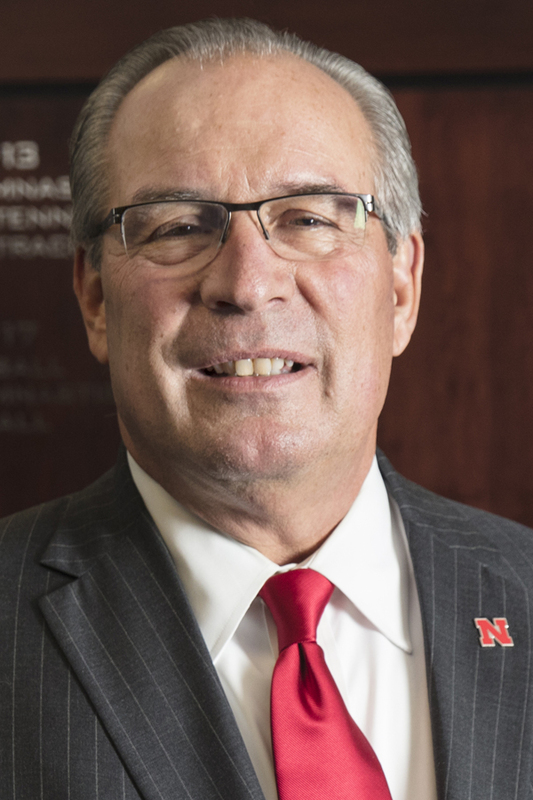 Green said the stature and strength of the Nebraska brand – including its long history of success as well as its unrivaled academic and life-skills support for student-athletes – drew considerable interest from top AD candidates around the country. 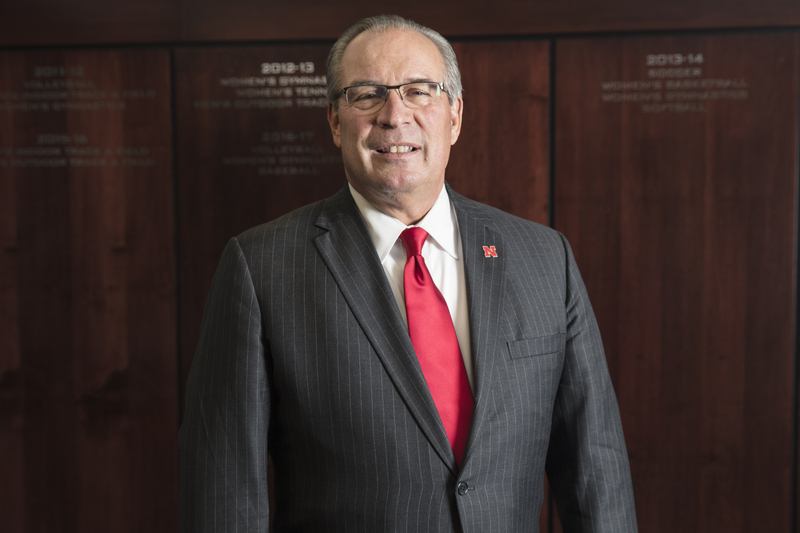 The chancellor said Moos rose to the top of a group of candidates that included several sitting athletic directors from Power 5 conference schools. Moos, he said, is a program-builder who forges enduring relationships with coaches, student-athletes, staff, supporters and fans. Moos, 66, has agreed to a five-year contract with Nebraska with a base annual salary of $1 million, plus incentives. In his seven years at Washington State, Moos secured a 10-year, $35 million marketing rights agreement with IMG College and led a $130 million addition and remodel of WSU’s football stadium. As the dean of Pac-12 athletic directors, he was in a leading position in securing the conference’s 12-year, $3 billion television contract with Fox and ESPN. In Moos’ time in Pullman, the Cougar Athletic Fund’s Annual Giving program has seen an 81 percent increase in gifts. From 2010-16, Cougar student-athletes and coaches earned 805 academic all-conference honors, 130 all-conference selections, 45 All-America accolades and three Pac-12 coach-of-the-year honors. Moos led Oregon’s athletics from 1995-2007, during which time the athletic department grew to national prominence – its annual budget rose from $18.5 million in his first year to more than $40 million by 2007 and became self-sufficient. In Moos’ Oregon tenure, the Ducks won 13 Pac-10 championships in six different sports; and UO student-athletes earned 722 academic all-conference selections, 34 Academic All-America selections, nine NCAA post Graduate Scholars and one NCAA Top VIII Award. 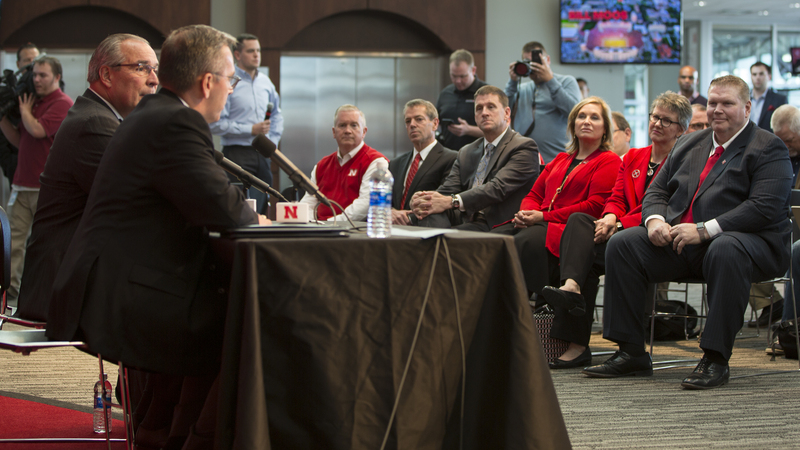 Chancellor Ronnie Green thanks Dave Rimington (right, seated) for serving as Nebraska's interim director of athletics, during the Oct. 15 announcement that Bill Moos has been hired to lead the Huskers. Moos came to Oregon after five years as the University of Montana’s director of athletics. He began his athletics career in 1982 as assistant athletics director at Washington State and also was the school’s associate director. He was director of development for more than five years and associate director for nearly two, supervising all external operations. For eight years prior to that, he managed and owned private businesses in Washington and Oregon. Raised on a wheat and cattle ranch in eastern Washington, Moos went to high school in Olympia when his father was in the governor’s cabinet. He earned a bachelor’s degree in history in Pullman and was a three-year letterman in football. He co-captained Washington State’s 1972 team and was first-team All-Pac-8. He and his wife Kendra have three daughters, Christa, Brittany and Kaiti; and two sons, Bo and Benjamin. Moos succeeds Shawn Eichorst, whose employment with the university ended Sept. 21. 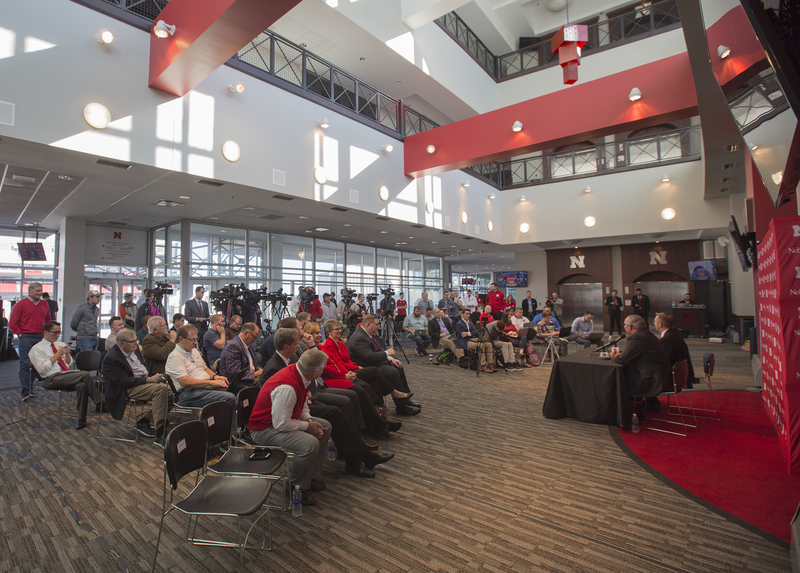 Reporters ask questions during Nebraska's Oct. 15 announcement that Bill Moos has been hired as director of athletics.